Frequentie tellers ( counter ) met een frequentiemeting van 10 Hz tot 3000 MHz (afhankelijk van model) tegen een betaalbare prijs. Bijna elke Aceco frequentieteller heeft een 10-cijferig display voor een nauwkeurige frequentieweergave. Ze functioneren zes uur op de ingebouwde Ni-Cad batterijen. Door hun zeer geringe afmetingen laten zij zich probleemloos meenemen. De behuizing is van oersterk hard aluminium. Een telescopische antenne levert op elke gewenste frequentie een optimale gevoeligheid voor frequentiemeting op afstand. De frequentietellers worden geleverd met een 12V netadapter voor het laden van de Ni-Cad batterijen. Hier onder ziet u uitgebreide uitleg van het eerste type van deze frequentie counter serie de FC1002. 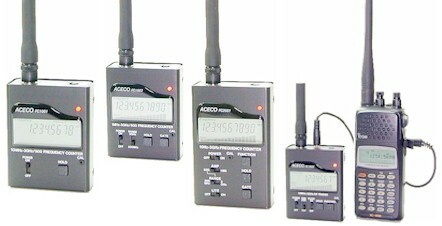 The Aceco FC1002 hand-held frequency counter is a supurb value low cost instrument. It is compact, truly pocket sized, test instrument designed for ease of use and dependable performance. Supplied as a complete with internal NiCd pack, AC wall charger and 7 section telescopic antenna. Power Switch - This slide switch turns the counter on and initiates a 2 second test of all the LCD segments. Hold Button - This holds the current display and stops the counter from counting. Calibration - The calibration adjustment opening is located on the front panel of the counter. This allows access to the trimmer capacitor that provides about a 10 PPM adjustment range of the time base oscillator.This is not usually necessary but to do so read a signal of an known frequency before adjusting the trimmer for correct frequency display. If you calibrate at 4.1943 MHz or above then the counter will be more accurate. Aceco Electronics, Corp. guarantees the counter and accessories for one year against defects in manufacture. This warranty does not cover items that have been modified, subject to unauthorized repairs, misuse or abuse. This warranty does not cover damage caused by excessive power levels applied to the signal input. Never make any kind of connection between the counter and a transmitter. When using the counter with an antenna for signal pick up, random frequencies may appear on the display. This is quite normal and is caused by the high gain of the receiver circuits which amplify noise in the absence of a strong readable signal. Never get the unit too close to a transmitter as internal damage will result.